Snow removal businesses, like every other business, must incorporate productivity improvements to keep up with the continual upward spiral of operating costs. Commercial plowing companies in the heavy snow markets have adopted the 2-plow concept, using a back plow in conjuction with a front plow, to help them stay ahead of their competition. • GREAT for Condos, loading docks, driveways… any dead-end application. • EXCLUSIVE HIGH LIFT blade raises over large drifts and pulls them away. • Scrape the surface cleaner in just one pass with the Hydraulic POWER DOWN. Single Cylinder — 70+SC, and 80+SC models are made tough for commercial use with downsize to full size 1/2 ton to 1 ton 4-wheel drive vehicles. Available in 6”, 7”, and 8” blade widths. 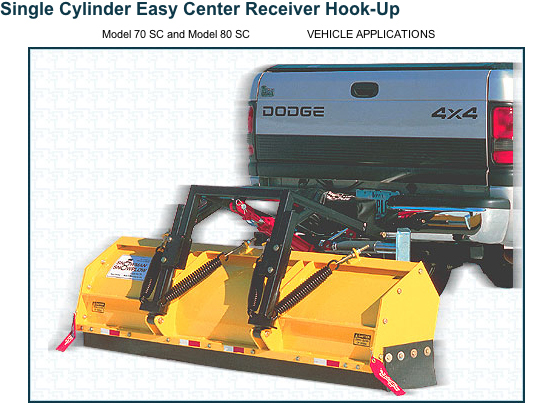 Add extension wings to the 70+SC to increase blade widths to 7-1/2” or 8-1/2” for the high volume jobs.